I’ve mentioned this before, but this week we got off in the middle of it for Veterans Day. While I completely support this holiday, I question the good of cutting a week down the middle. What it basically created for me at least was a whole lot of time I seemed to be occupying space in a chair but not getting much accomplished… because individuals smarter than me ended up taking either the entire front half of the week off… or the entire back half of the week off. Those people apparently did not coordinate well, which meant there was a skeleton crew on board and few of the people you actually needed to talk about this item or that available and ready to discuss. My hope is this coming week we can make up ground for all of the perceived lost time from this fractured week. On the gaming front though… this was a week entirely about Fallout 4. However while prepping the AggroChat episode I watched another sequence play out on twitter that I am going to get into towards the end of the post. 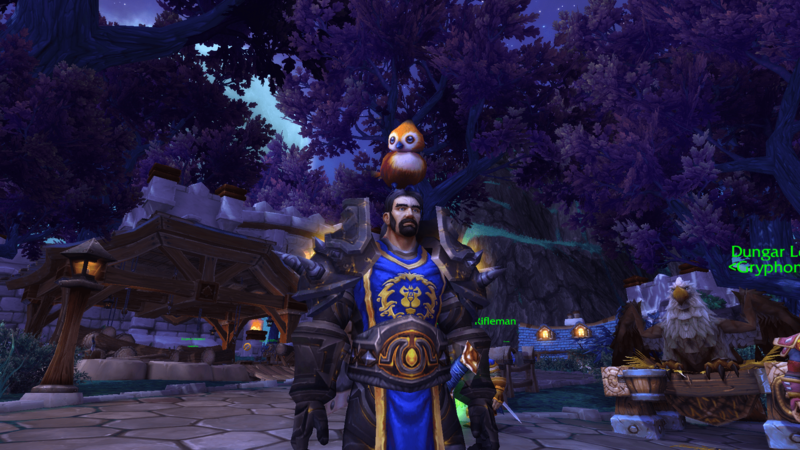 I am admitting here again that I am still struggling with an irrational desire to log in and play World of Warcraft. I think part of it is simply because I know that as much as I loved Gladiator… it will be going away in the coming expansion. Part of me wants to spend some more time playing as a DPS sword and board warrior while it still exists. Then the rational mind kicks and tells me that there is still nothing really there for you. 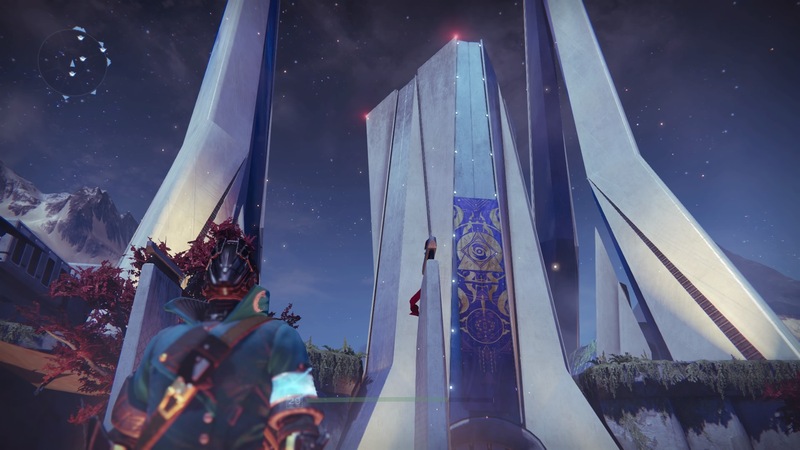 The raid is gone, the guild is mostly gone… there just isn’t an infrastructure to return to. Similarly I realize that other than faffing about and running old content… there is nothing much there that I would really want to do. This reached its peak over the weekend while I was anxiously wanting to play Fallout 4, but not able to do it yet without VPN hackery. The problem is even though I am wallowing fully in the goodness that is post apocalyptic Boston…. there is still a bit of nostalgia tugging at my coat tails telling me that I would really like to log into World of Warcraft still. I have a slew of new content to go experience in Final Fantasy XIV as well, so hopefully between it and Fallout 4… I will slowly quell this desire. I am still really damned interested in seeing how Legion feels, so not giving up hopes on maybe being able to wrangle a beta invite somewhere… but unfortunately I think my past points of access are no longer available. If I had them I would have definitely tried to exercise one for access to Overwatch. Monday night I got so low that I booted back up Fallout New Vegas and spent a good deal of time wandering around there. I only managed to get as far as the Vikki and Vance casino before finally attempting to get Fallout 4 going. I have to say… it might be nostalgia talking… but I still absolutely love this game. I even popped in for a bit this morning to get this screenshot… and there is absolutely a direct lineage between Fallout 3, New Vegas and 4. The world feels the same… albeit considerably prettier in the newest incarnation. I guess this is why in part folks who hated Fallout… still hate it… and the folks that loved it… are having some of the best times of their life. New Vegas really raised the bar for the way the world felt, and it seems like Bethesda rose to the occasion and answered this narrative call. That said… there is a part of me that kinda hopes that we end up with a DC Metro and New Vegas reboot using the Fallout 4 engine… much the same way as we have one of those under works for Morrowind and Oblivion using the Skyrim engine. I would love to be able to roam around these areas with the fidelity that the new engine provides. 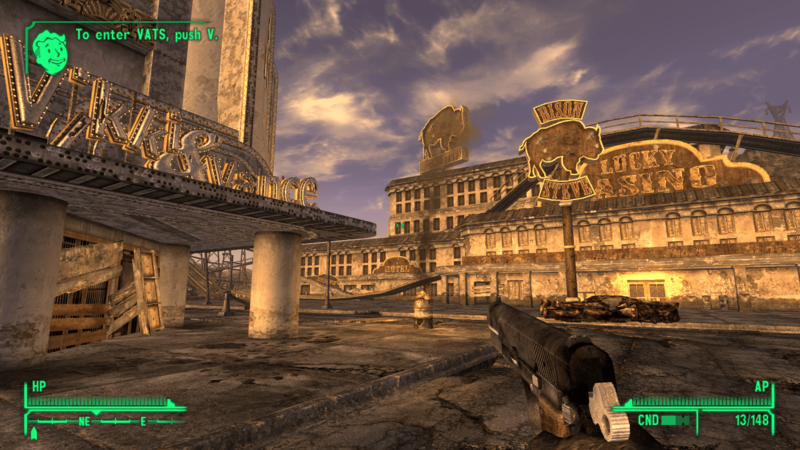 Even then… I could still see myself returning to New Vegas time and time again… and loving every moment of it. The bulk of my week has been spent wandering around the Massachusetts area in the new Fallout 4 on the PC. Firstly I have to say… I am pleased and amazed at just how good this game looks and how well it runs on my fairly aging hardware. The game auto selected Ultra for me, and I have been playing on that since… with limited hick-ups. The game runs between 50-60 fps at all times and just works flawlessly. Folks are reporting all sorts of bugs… and honestly I haven’t really seen them other than the usual floating objects type issues when you are dealing with a complex open world game. For example… if you remove a table out front under a vase… there is a chance the vase will just hang there indefinitely rather than fall to the ground. This sort of stuff does not bother me at all, and I come to expect it when a game has physics and the ability to place objects. That said there are apparently a number of the traditional day one Bethesda bugs but I am happy to say that I have not encountered any of them… game breaking or not. Maybe I am simply lucky, or maybe I just have not gotten far enough into the game to experience them. According to steam I am roughly 50 hours into the game… the problem with that is that I accidentally left it running one day while at work… so you can discount about eight hours of that time as that event happening. The rest of the time however is absolutely real… and I have built up at least partially every settlement that I have come across. That is the part of the game that is the real hook for me… especially now that I have trade routes going between the towns. I’ve said this before, but my big take away from why this game is more enjoyable than the previous incarnations is that it feels like I am actively making the world a better place. In other Fallout games… you were the good guy, simply because you were killing off all of the bad guys in the world. There was very little you could do to actually improve the lot of the other denizens of the wastes other than the occasional donation of money or fresh water. In this game… from the very beginning you are actively improving segments of the world and making it a decent place to live in. Sure the world is dangerous… but you are making it far less so for a group of settlers. That right there is the hook, and when I am out in the wastes… every hotplate and desk fan… excites me because I can go back and build something really cool with the parts. While prepping this post today I watched a little exchange on twitter. Essentially one of my friends challenged streamers to do more with the games they are streaming. That it would be nice to have streamers take a mostly educational stance on either showing other gamers how to do something… or working through problems. While I think that might be pretty cool, the truth is that is not at all why game companies seek out streamers. I am going to give an analogy that is going to be a bit long winded, but stay with me. I grew up in a small town in Oklahoma, and in this part of the land there are few things more important than High School sports. I have my own damage thanks to this fact, and having no interest in sports at all… but that is a tale for another day. In a small town the team is the center of pride for the community… and while high school athletics has the possibility of making money for a district… in a small town it is mostly a giant hole that you pour money down. So when it came to maintaining facilities, it was always a struggle… and knowing this soft drink companies would often times ride in on a white horse to save the day. 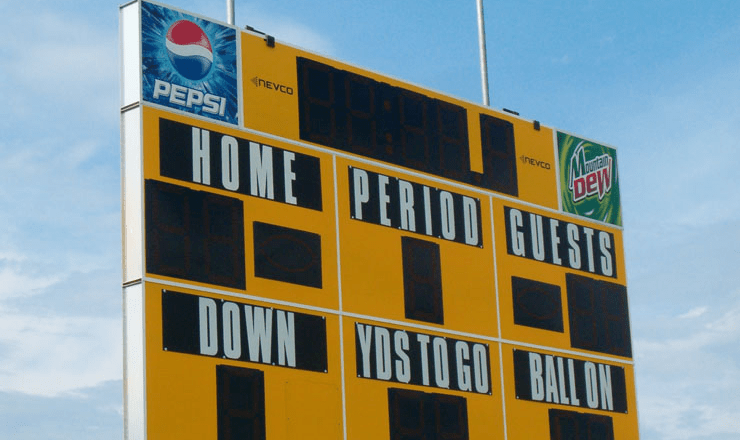 There was not a small town anywhere near me that did not have either a big Pepsi logo or a big Coca-Cola logo on their score board. Of note I have no clue who’s scoreboard this one actually is, but I am just using it to illustrate my point. They would offer to sponsor the scoreboard, make sure the school district had a free supply of cups, lids and straws… brand new pop machines… and a discounted rate on the soda itself just so long as they would sign an exclusive contract with the brand and only allow their products to be sold at school events. The schools needed the goods they were offering… and could make money selling the product which then would end up supporting the school. Pepsi got advertising out of the deal and more than likely converted a good segment of the townsfolk into loyal Pepsi or Coke drinkers for life. My small town had Pepsi and it is probably no small coincidence that I grew up in a household that drank Pepsi and still drink predominately Pepsi products. The indoctrination works, and goes back for generations… so much so that when a school changes affiliation there is often times an uproar in the community. So you are asking yourself… Bel… you just told us an elaborate story… but you said it was about streaming? This is precisely what is happening with game companies and streamers. There is a natural symbiosis at work. The gamers need a fresh supply of whatever happens to be the hotly contested games to stream, in order to keep the eyeballs on their channel, and the companies need to have their games placed strategically on as many channels with as many eyeballs as possible. So even if there is no payola happening under the table… the streamers are actively promoting the products of these games companies. In fact there is a not so subtle desire on the part of the streamers to keep from burning any bridges with a company… because that could very well mean that they would lose their privileged access to new releases. On the part of the company… all they really want out of the deal is for this streamer to look like they are having a really good time playing their product, that way someone leaves the channel and gets convinced to subscribe or pre-order because it looked so appealing. Sure it would make sense for them to serve a greater educational purpose… but honestly… the big popular streams aren’t doing this. The popular streamers are entertainers first and foremost. They are selling themselves playing this game more than the game itself. They build up loyal followings because the people are interested in the person, not so much what they are doing. The advertising still works however because it is subtle. They might have their back wall decorated in products of the company they are streaming for, or be wearing branded merchandise that the company provided… or even giving away items for the game on their streams. While all of these seems fairly natural and filters into our subconscious as benign… it is absolutely planned branding and ultimately we are the dollars that the companies and the streamers are trying to get. Once upon a time… game companies cared deeply about what the blogosphere was saying about their game. That time unfortunately is over, and over the last few months I have come to realize something. Blogging is not dead by any means… and nor is Podcasting really… but in the gaming sphere neither are they growing. Once you leave the land of MMO gaming… you are hard pressed to find ANY blogs devoted to games. For example I have crawled the internet trying to find a source of news and information about Destiny other than Reddit. There is simply no one out there blogging on a regular basis and producing content explaining how the finer points of the game work. There are however hundreds of YouTube channels and streamers devoted to this niche. There are almost no blogs devoted to Call of Duty, but similarly there are thousands of channels devoted to it. While blogging was the comfort zone of my generation that grew up reading game forums… and podcasting is the natural extension of that… the next generation no longer really cares about it. They are completely connected to YouTube and Twitch as their game information sources, and as a result… I feel like the bloggers really don’t have much sway. I am not trying to do this as a living, so in the grand scheme of thing it doesn’t matter too much other than the fact that I don’t have much of a shot in hell of getting into this exclusive alpha or that limited beta. The companies know exactly what they are doing… and quite simply they are playing the numbers. They are putting their product in front of as many eyeballs as they can, and doing so in the medium that has the largest majority of those eyeballs… Twitch and YouTube.